Available in 8ft, 9ft,10ft, 11ft and 12ft widths, our main image shows a 12ft x 12ft Apex, with a green coloured roof, white PVCu gutters, a 4ft double fully glazed PVCu door, two 2ft full height glazed PVCu panels, a 3ft half glazed residential PVCu door, and a 4ft PVCu window, all in white. We can also offer the PVCu in Light Oak, Mahogany and Brown. How would you like yours? The garden room can be incorporated into your garage- we will provide a partition wall and your Garden Room becomes an extension on your garage. Specified at the same time as the main garage, costs are reduced. PVCu units can be used to provide a double aspect to your Garden Room- put them in the side wall as well as the end wall to give maximum visibility and light. The building can be lined out, and with provision of electricity (by others) can become a wonderful retreat, or can be used as a home office, music/hobby room/gym- the possibilities are endless. We provide the building, you provide the use! You can choose from our exclusive Stone and Brick effect wall finishes, or specify your building in plain panel finish for site rendering. We can even provide wall finishes on, say, two of four sides, if you're fitting the Garden Room into a corner site, maximising appearance whilst minimising cost. 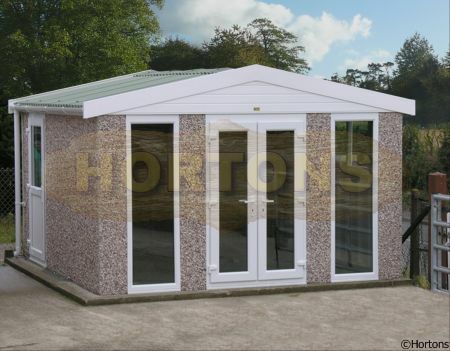 Utilising our range of PVCu units, the Garden Room can be constructed for you from our standard range buildings, including a Pent roof, Apex roof, Windsor tile effect roof or the top of the range Metrotile roof. The whole range of sizes of our standard building is available, with widths from 4ft to 26ft, lengths to suit.